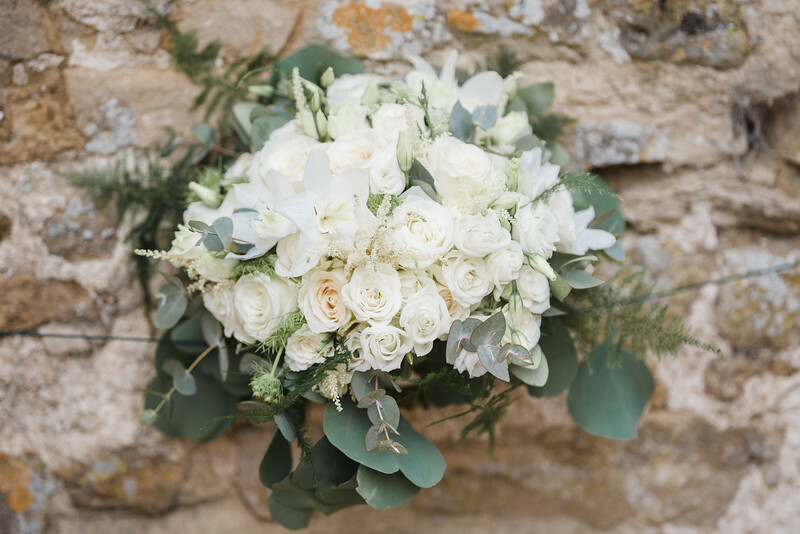 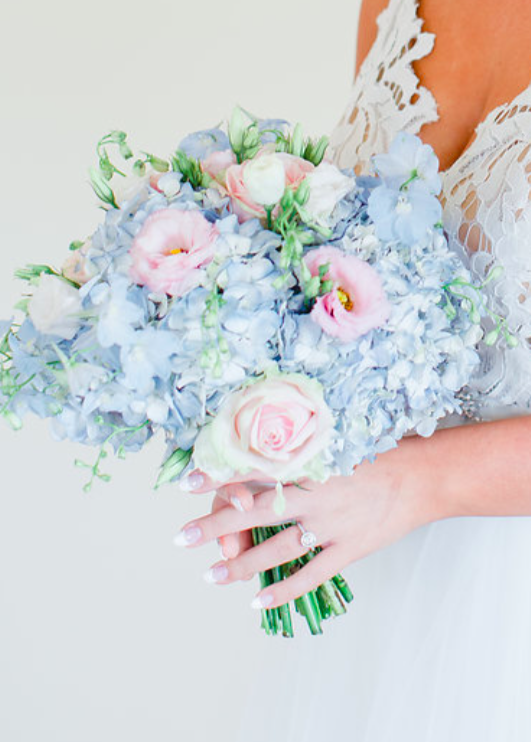 Catherine and Daniel's elegant Caswell House wedding flowers - Joanna Carter Wedding Flowers | Oxford, Oxfordshire, Berkshire, Buckinghamshire and London. 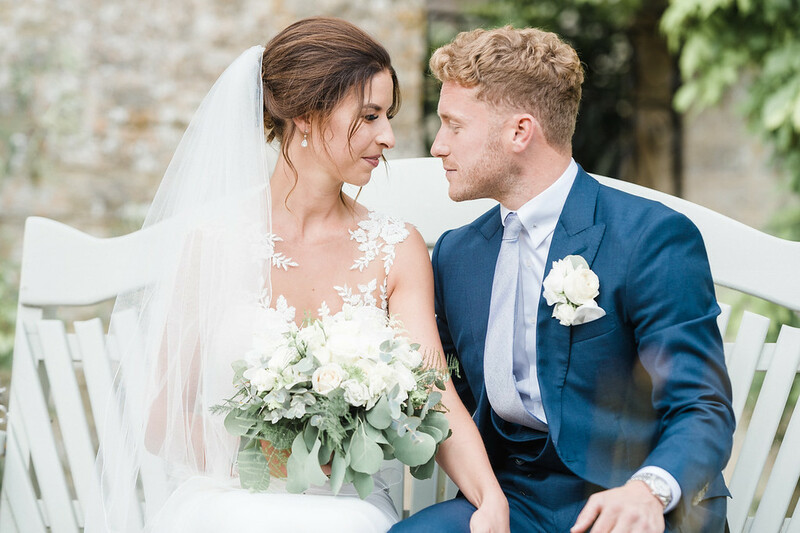 In the midst of this summer’s stunning weather, holding your wedding in a venue with a lovely outdoor ceremony area is a definite advantage. 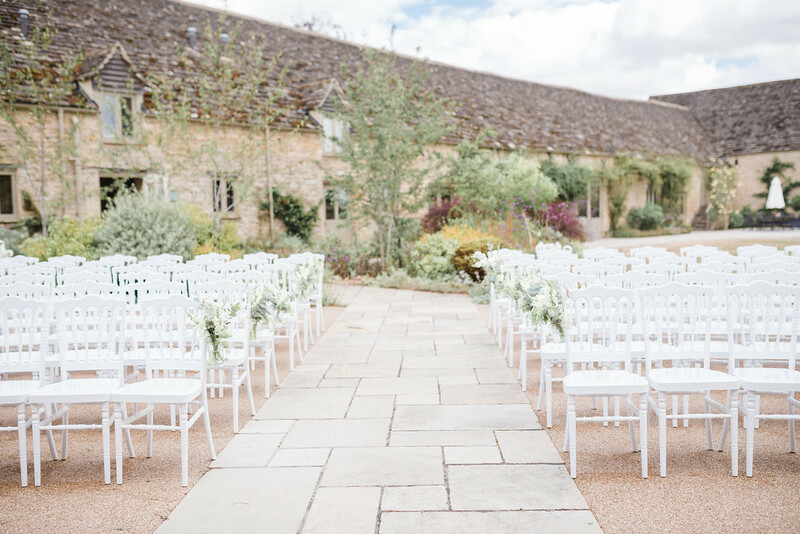 Caswell House (www.caswellhouse.co.uk) is lucky enough to have a beautiful outdoor ceremony area, set in gorgeous gardens that were just perfect in the lovely weather we had this summer. 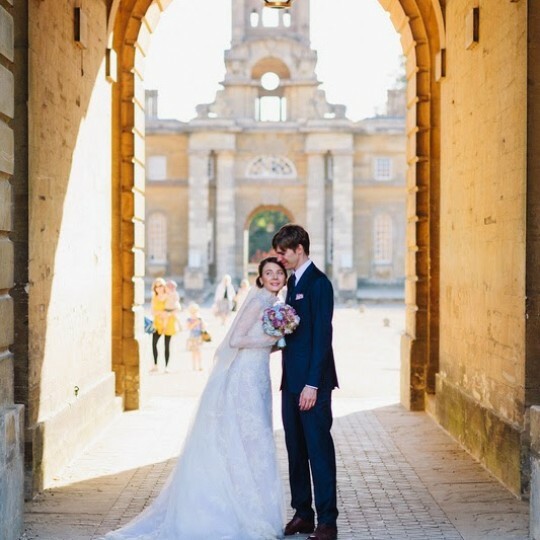 Catherine and Daniel got married at the end of July on a gloriously sunny day. 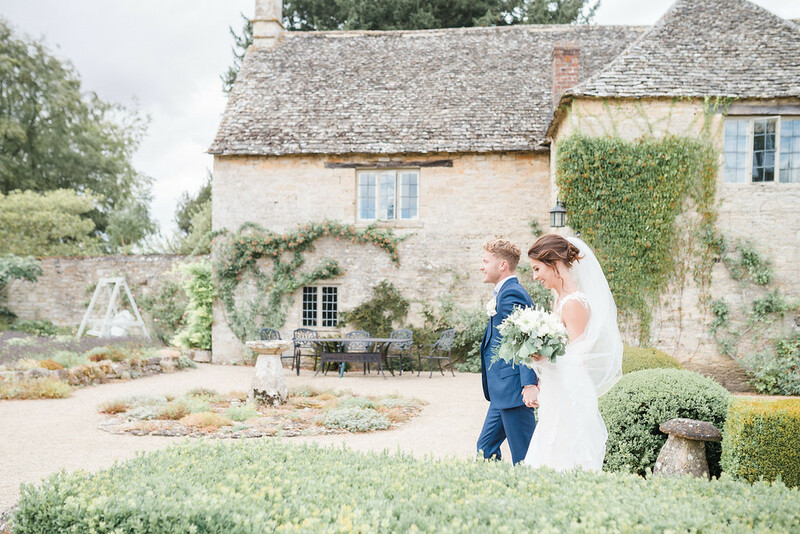 They held their ceremony outside under the gorgeous cotswold stone loggia, with drinks in the lovely gardens and then their wedding breakfast in the stone barn. 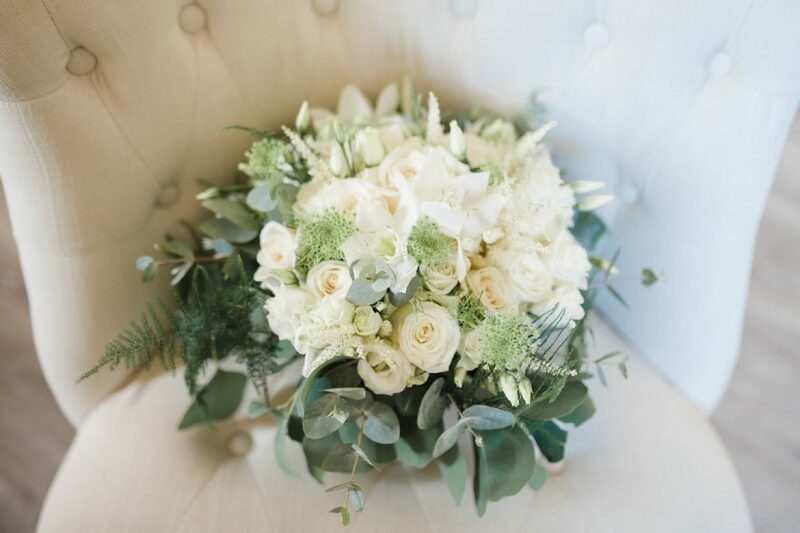 Catherine kept to a beautifully classic understated green and white palette with plenty of mixed green foliage. 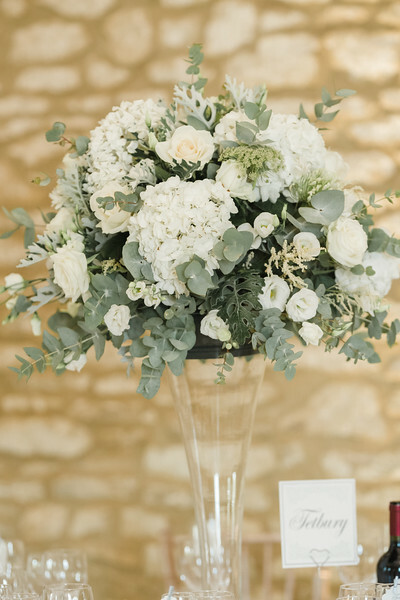 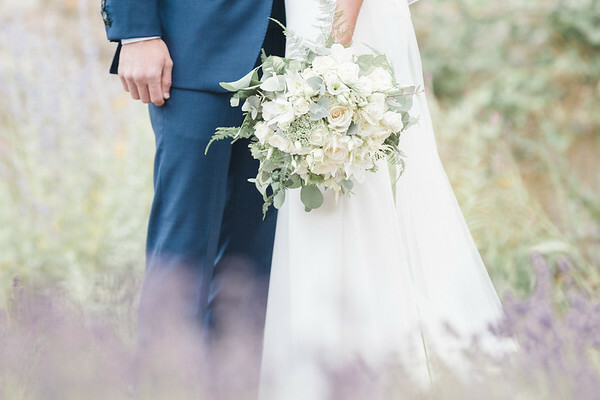 We used a range of stunning white and ivory flowers including roses, ammi, spray roses, astilbe, hydrangea, eucharis lily, agapanthus, scabious and antirrhinum. 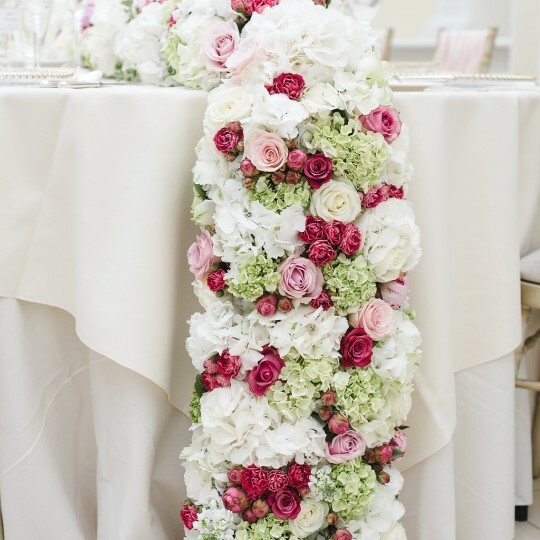 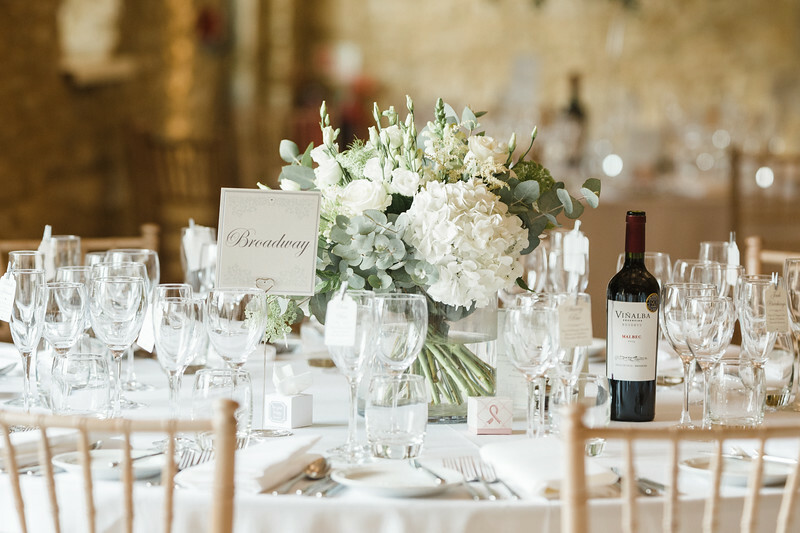 We loved the elegance of Catherine and Daniel’s wedding. 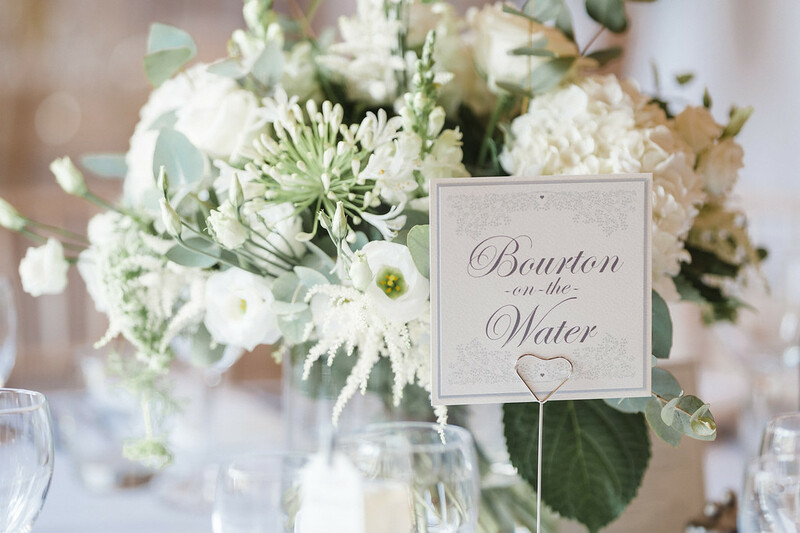 A big thank you to photographer Hannah McClune (www.hannahmcclunephotography.com) for these stunning images. 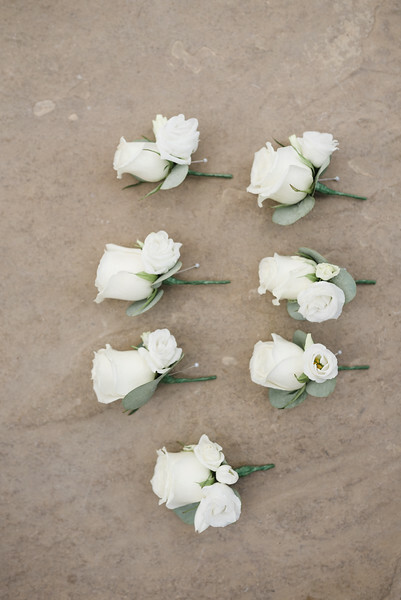 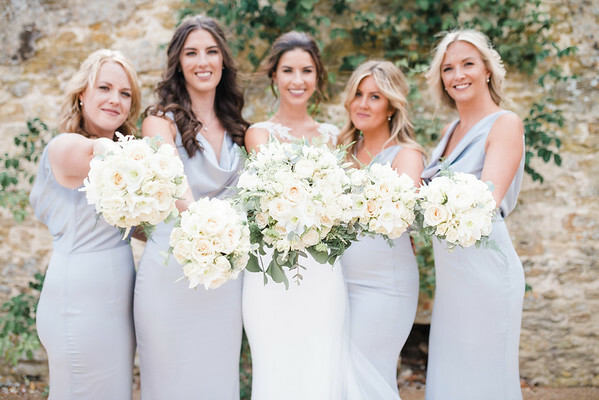 The bridesmaids carried domes of roses, eucharis lily, spray rose and a light collar of senecio foliage to pick up on their soft grey dresses. 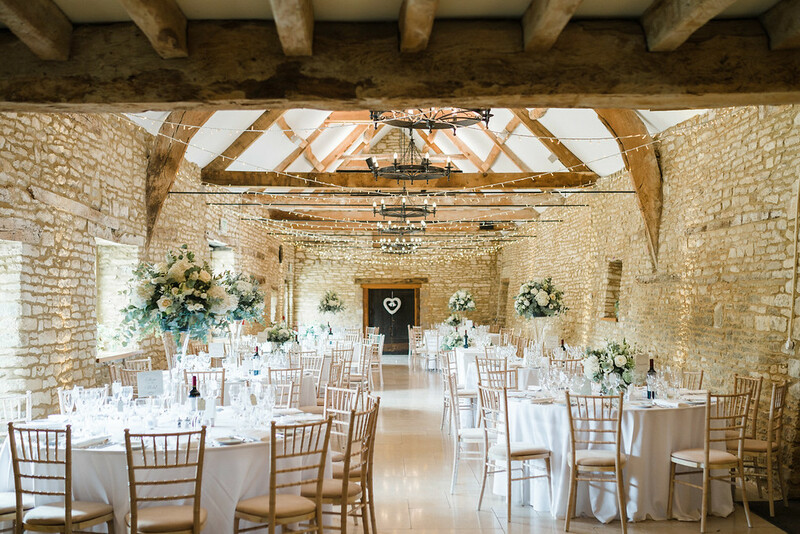 The couple’s wedding breakfast was held in the light and airy setting of Wenman’s Barn with its lovely warm cotswold stone walls. 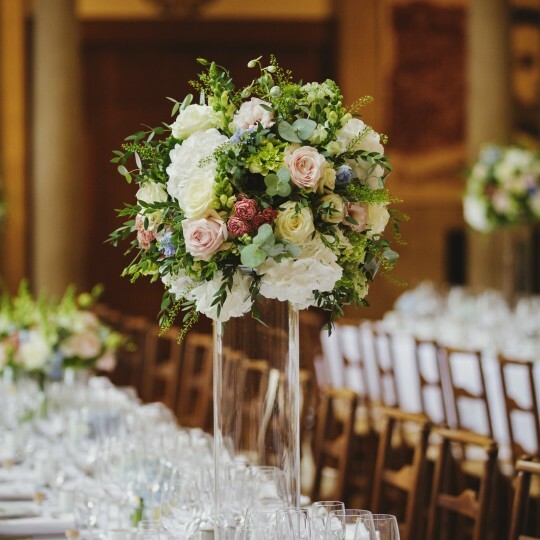 We used mixed tall clear glass flute vases and low round cylinder vases, all filled with lovely mixed arrangements. 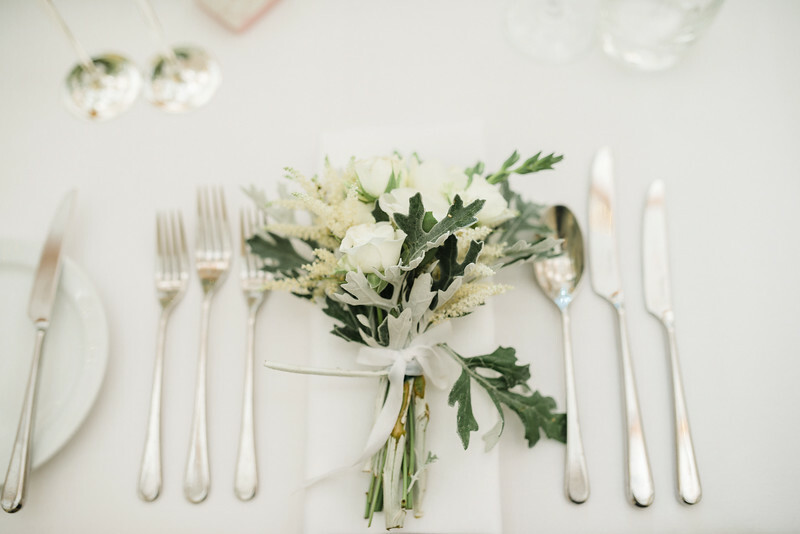 We placed small place setting clusters on Catherine and Daniels napkins as a small gift from us to wish them a happy wedding day. 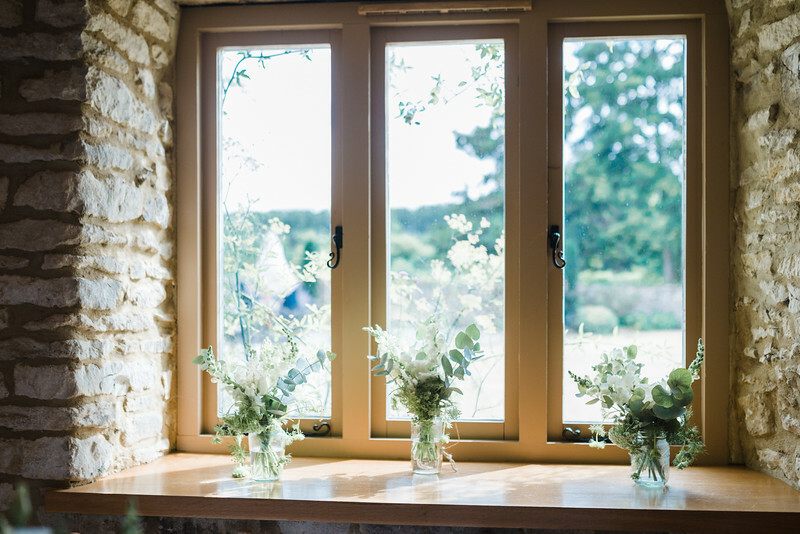 In the window sills we placed small flower clusters to echo the main table arrangements.